Fun fact, the original joke at the start of this video was going to be me wondering what my wife had been up to, but I switched it to my kids for reason. 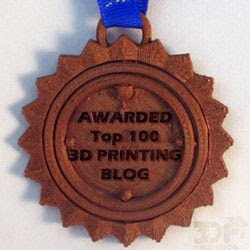 John Brandon's article about the slow, sad, and ultimately predictable decline of 3D printing is badly written, badly cited, leans too heavily on personal experience, and kicked off some great conversation. Forcing 3D printing to defend itself to prove Mr. Brandon wrong showed just how alive 3D printing is. Sure, 3D printing stocks are down, well, unless you're lulzbot. But the companies with slumping stocks are generally the ones who threw everything they had at 3D printing to cash in on the hype and it turns out the exchange rate for hype isn't that great. Lulzbot on the other hand, and other's like them, kept expectations manageable and growth modest and they're doing better and better. That's not just good business when it comes to 3D printing. That's good business in general. Make it real. Brandon's first step was to "Make sure to try it yourself" but I say make it real. Can you see it? Can you feel it? Can you go to where it is? Can you try it yourself? Then do so. But keep it cheap. The goal here is to crash early and not to kill yourself financially in the process. Fail early, fail cheap. For instance, I didn't jump in an buy a 3D printer or try building my own. Instead I modeled a Chinese Chess set, put it out there and got someone else with a 3D printer to print it. He charged me $25, which is quite a bit for a chess set, but not so much for a custom chess set. The moment I held it in my hand, the moment I made it real, I was never going to turn back. But without this experience I might have eventually left 3D printing alone. If I can't make a thing real then it may be cool, but it's not for me. Talk to the insiders. Brandon's "Ask hard questions" bullet point is just the worst. Asking hard questions is good, but he doesn't list hard questions you should ask. He complains that he couldn't get good answers back in the day, that his hard questions weren't answered, but he still went with 3D printing, so who's the fool? I mentioned some questions above, and I'll mention some below, but here I'm going to say "Talk to the insiders" because that leads to the next point perfectly. Find people who are into the hype and find out what they're doing. For 3D printing find a local maker, read interviews about industry leaders, see what people are doing with the technology. Learn how it's changing other people's lives and get a little excited. Find out what's possible. Talk to outsiders. There's always detractors and you should let them have their say. Do they have a point? Listen to them and let them talk you out of it. Here's where you try to answer the hard questions: What can go wrong? What's the worst case scenario for me? How much do I stand to loose? What are the risks? What are the dangers? Why shouldn't I be excited about this? Do the math. The math in this example is pretty obvious, though Mr. Brandon doesn't seem capable of it. But your math should include not just money, but time. A Makerbot Thing-o-matic debuted at $1225 for an unassembled kit. $1225 for a machine that can turn plastic into anything? That's a steal, right? Not when you took into account the more than 8 hours is it would probably take to assemble it. I knew many people who bought the Thing-o-matic and never made anything because "I'm just trying to find the time to put it together". That alone was enough to keep me away until I won a 3D printer, and I had to be pretty awesome to pull that off. And it came preassembled. So thank goodness otherwise I probably would still be on the outside looking in. It's not bad to be excited about something. It's not bad to be caught up in the hype. But always, always try to talk yourself out of it. Then again, if it's destined to be, then jump in with both feet. Don't pussyfoot into it then whine later when your experimental water-bottle cage breaks. 3D printing is still awesome. And if anyone has a broken cup holder for a SAAB they can send me I'll gladly model it for them. This wasn't the first video I was going to do this week. That video, about the history of Makerbot and their community, got overwritten in the output process because I'm an idiot. Not having time to re-record it I had to scramble to edit this video, a video I worked hard to get ahead so I would have a video next week. Turns out the audio for this one is less than ideal, but it's what I have to go with. So now I've got to re-record this week's video for next week, and I don't think I'll have time for that this week. If'n I don't I'll just pull out a quick Vlog and give away another book or two.